This is the story of Amara’s last week in 3rd grade. You should read all about Monday and the Honor Roll Ceremony; Tuesday and learning to knit; and Wednesday’s End of Year Party if you haven’t already. Thursday was their last day of school and as always, it was crazy hair day! 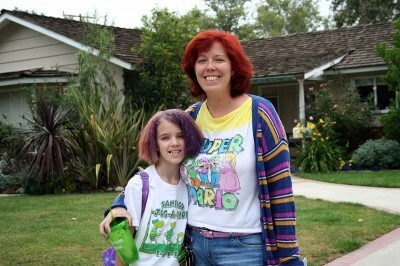 Jenna had crimped Amara’s hair and sprayed it with all sorts of colors. I told her it reminded me of the circus afro wig. It was a blast taking her to school and seeing all the different hair-dos. Again, the photos I wish I could share! For the last day of school the Kona Ice truck was coming. 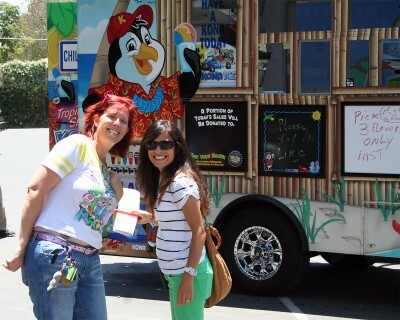 Any student who had been on honor roll would get a free Kona Ice. The rest of the students could purchase them for $2. This had been such a huge hit when they had done it for Honor Roll the last time. There was another secret! Jenna wasn’t over being sick but she was feeling better and she went to the classroom to tell them goodbye and to announce she was buying each of them a Kona Ice! The cheers went up in the class! The sun had come out and it was a beautiful afternoon to say good-bye until the fall and to enjoy a special treat. 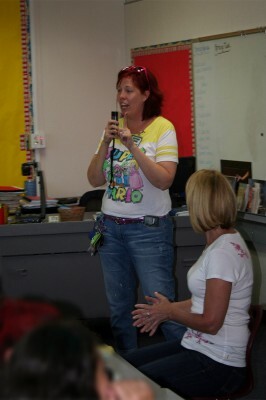 I am so glad I was there to enjoy all the fun of this week! We thought it couldn’t get any better. We were wrong. As we climbed into the car to go home, Amara announced yet another award! She won the AR award for the 3rd grade. AR is the Accelerated Reading program. You get points for the number of books and reports you complete. She was very proud of being the number one reader in her class. This memory was posted in Special Occasions and tagged Amara, crazy hair, Kona Ice, school on June 21, 2013 by Grandma Kc. Fabulous end to another year, and onward to the summer vacation at last! Good memories all along the way! Thanks for sharing such joy in your lives. No better ending for anything–a last day of school, the end of second grade, whatever–than ice cream. It would be such a much better world if every child had the kind of loving support we see in your blog–family and school. I certainly agree with Olga – these stories are so heartwarming because they show a child who thrives in every area because of the love and support she has from home. Sure it takes time, energy, and (optionally) money, but if the motivation is love, then everything expended is given in joy. If only every child had those advantages – we could shut down Juvenile Detention Centers across the country. Such a generous surprise from Jenna. I’m sure those kids truly adore her! Congratulations to Amara on yet another award. The intelligent and beautiful young lady never ceases to amaze me. Great way to end an incredible week! I’m wondering if, after such fun at school, those kids are lamenting the start of summer! What a fun celebration for the last day of school! Love the crazy hair, and the wonderful gift to the class from Jenna!! Congratulations to Amara on her AR award! And congratulations to Jenna and Justin, and Grama and Grampy for all the dedication you have shown not only to Amara, but to her entire class. Your enthusiasm has been so important to all of the students and I know they have thrived because of it! I can’t wait to see what 4th grade will bring!! Crazy hair day sounds like a fun way for everyone to participate. Congratulations to Amara for all of her academic accomplishments. I also want to tip my hat to Jenna for buying the rest of the class ices. As I get older and wiser, I can’t say I like programs that are intended as incentives but in reality just make hard feelings and separate groups of kids. Here’s hoping Amara and her loving family have the best ever summer and that fourth grade is a blast. Sounds like the last week of school is the best week of the year. How long will Amara be able to go to that school? Fortunately Amara can go there through eighth grade. When she first started there the school only went through fifth but they have added a grade for the last 3 years which is wonderful! It is a great school and her other options for sixth grade were 50/50 she would get into a good school. She would have been eligible for 2 different schools – one with a very bad rating and one with a great rating but it is by lottery! Very glad things have worked out the way they have. Congratulations to Amara! A child who loves reading will do just fine in school–and in life. How cute are Amara and Jenna with their fun hair?? Amara must go to an excellent school- they really seem to go to a lot of trouble to make it a great environment for the kids! Looking forward to reading about your summer adventures with Amara!